6 x 8 x 3 in. A single glance at this piece suggests the processand potential problemsinvolved in reading a book. The oval cut in the center of the book allows the viewer to see instantly through a number of pages, but this opportunity only prevents rather than facilitates normal reading. The printed text is reduced to an abstract surface of black ink and white space: inscription without legible script. 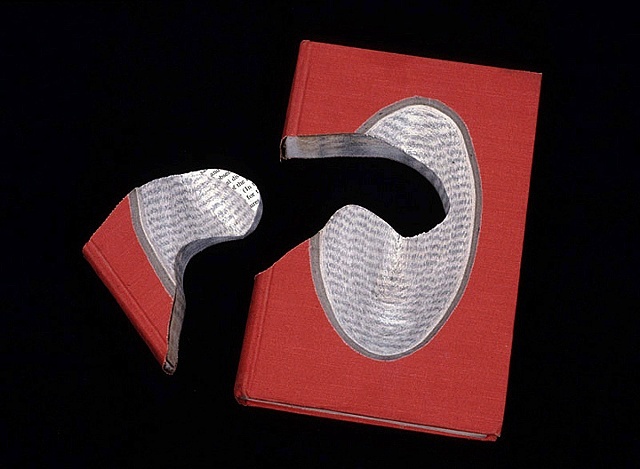 The interjection of another cut out shape into the text block of the booklike the orphaned piece of a missing puzzle, rather than the missing puzzle piece of a potentially integrated forminterrupts further the visual coherence of the text.